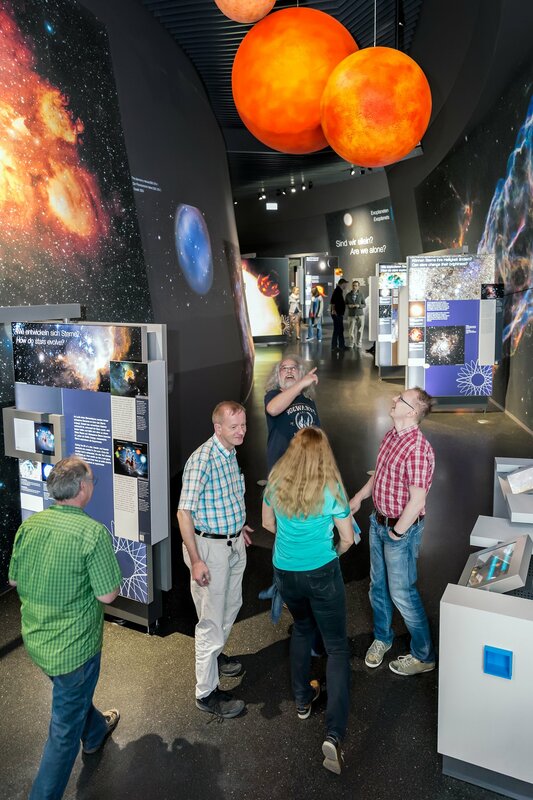 There is a new supernova over Munich and you should not miss the opportunity to check it out, regardless of your age. From a fulldome planetarium to a modern and interactive exhibition with 13 different themes, guided tours and numerous special events, we offer many ways to get excited about astronomy. Join us and experience the Universe you live in! We have developed programmes for families, schools, and other members of the general public. The ticket for a planetarium show costs €5/person, and the ticket for a guided tour costs €8/person. For public evening events, please consult our programme, as prices vary. If you wish to watch a planetarium show, have a guided tour or participate in a Friday evening event, you kindly ask you to purchase tickets online. You can also buy tickets directly on site at the entrance. Admission to explore the exhibition on your own is free of charge and requires no prior booking. Prices are the same for all visitors. Unfortunately we do not offer refunds. Organised school groups continue to enjoy our education programme free of charge. Teachers should read the following page for additional information on how to organise school visits and should fill out the form on that page to make a request. For additional information, teachers can contact us at the email address education@eso.org. Special events, such as evening talks, can take place outside these opening hours. Please check the programme for more details. ESO Supernova is closed every Monday and Tuesday. Also, it will be closed from 24 December 2019 to 7 January 2020.